The life of Aurobindo Ghose was marked by stunning reversals and seeming contradictions. Yet, when viewed as a whole, the course of his life was consistent and clear. Aurobindo was born in India into an upper-caste Hindu family but spent most of his childhood and youth studying in England. He was a leader in the movement for Indian independence for four years before he sud­denly abandoned politics and gave himself entirely to a spiritual life. Aurobindo devoted much of his time to meditation and yoga for the last four decades of his life and never left his ashram in southern India. Yet he wrote with clarity and insight about modern European and American science, politics, religion, psychology, and education as well as about his own spiritual knowledge and his understanding of Indian culture, history, and needs. Aurobindo Ghose was born in Calcutta, India, in 1872. His fa­ther, an upper-caste member who had received his medical train­ing in England, both despaired of the decadence and degradation of colonial India and admired the energy and power of Victorian English culture. In 1879 he sent all three of his sons to England for their schooling. Aurobindo, the youngest child, lived first with the family of an Anglican minister, then entered boarding school, and completed his studies at Cambridge University. Although his fa­ther had instructed that his sons be taught nothing about their na­tive land, in his late teens Aurobindo learned of the incipient movement for the liberation of India from the British empire and became involved in student groups that agitated for Indian inde­pendence. Aurobindo returned to India soon after his graduation in 1893. When he first stepped onto Indian soil, he discovered within him­self a deep, unshakable feeling of inner peace. He later described this experience as the first step in his spiritual awakening. Aurobindo gained employment in Baroda, first as a civil servant and later as a teacher and vice-principal at Baroda College. In the decade after his return to his homeland, he devoted himself to studying the languages and cultures of India. He also began a secret involvement in the movement for Indian independence. In 1906 Aurobindo moved to Calcutta to become principal of the Bengal National College. Here his previously secret com­mitment to political work soon became public, as he began to provide leadership for the independence movement in Bengal. Aurobindo edited a newspaper that promoted independence, spoke publicly about the need for passive resistance to British rule, and participated in the organization of a secret revolutionary group that began to prepare for the possibility of armed rebellion in the future. Within a year Aurobindo had become one of the major leaders of the nationalistic forces throughout Bengal. In 1908 the British colonial authorities arrested Aurobindo, charged him with treason, and imprisoned him in Alipore jail. Aurobindo spent an entire year in prison awaiting his trial. In this time he studied the Bhagavad Gita and the Upanishads and inten­sified his yoga and meditation practice. In 1909 he was tried and acquitted. Immediately after his release, Aurobindo returned to his political work, speaking widely and starting two newspapers. Within a few months, however, Aurobindo received what he felt to be a divine command to abandon his political work and take up an entirely spiritual life. At once he left Calcutta and traveled to Chandernagore in French India. A short time later he moved on to Puducherry, ninety five miles south of Madras on the eastern coast of India, where he remained for the last forty years of his life. Despite the urging of his former political associates on many occasions, Aurobindo took no direct part in the indepen­dence movement after 1910. Aurobindo had begun his practice of yoga in 1904. He had searched for a guru for several years but, finding none, had taught himself through his study of the ancient Hindu scriptures. In 1907, with the assistance of Sri Lele, Aurobindo experienced his first of four major spiritual openings: samadhi, the experience of oneness between self and Brahman, the ultimate reality. a living, personal God who brought a transformation of light to all who surrendered themselves to Him.
. . . a vision of the supreme Reality as a multiform Unity, simultaneously static and dynamic, character­ized by silence and expression, emptiness and creativ­ity, infinite and yet composed of manifold forms. In this vision Aurobindo saw the Divine as both immanent in all things of the world and simultaneously transcendent to the world that humans know. He discovered the evolutionary need not to reject any part of reality, as many previous Hindu mystics had done, but to understand all of reality as divine and worthy of liberation. In his first decade in Puducherry, Aurobindo lived with a small group of followers who had come with him from Calcutta. 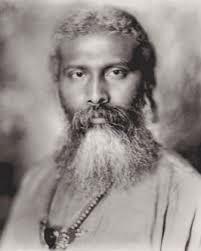 From 1914 to 1921 he edited Arya, a journal in which he published in the form of serial articles most of what would constitute his major writings, including The Life Divine, The Human Cycle, The Ideal of Human Unity, and Bases of Yoga. By 1926 Aurobindo’s community of followers and students had grown from a handful of people to several hundred members. In that year Aurobindo experienced his fourth illumination: his “Day of Siddhi” when he felt the Overmind, a higher spiritual level of being than mind, descend into the physical plane of this planet. Immediately after this experience, Aurobindo turned over the responsibilities of administering this community, which soon took the form of the Sri Aurobindo Ashram, to Mira Alfassa, The Mother. He retired into an almost complete seclusion for the rest of his life, al­though he stayed very much in touch with the world through peri­odicals and letters and did appear in public on four occasions each year. He also kept up a voluminous correspondence with his disciples in the ashram. While Aurobindo lived in seclusion for the final third of his life, he broke his public silence on two occasions. During World War II he saw Hitler and the Nazi forces as the expression of pure evil in the world and appealed to all Indians to put aside their grievances with the British temporarily and to support them in the war against Germany. In 1947 India received her independence on August 15, Aurobindo’s seventy-fifth birthday, and Aurobindo delivered a radio speech about the significance of the day and the event. Aurobindo Ghose died in 1950. Mira Alfassa lived on until 1973. In those twenty-three years she guided the Ashram and its attempt to embody Aurobindo’s teachings. By the late 1960s the community had grown to more than two thousand members from all over the world. In 1968 the followers of Aurobindo founded Auroville, a spiritually based “city of the future” near the Ashram, which has been recognized by the Indian government as an international city-state. The Sri Aurobindo Ashram and Auroville are both alive and well in the world today.